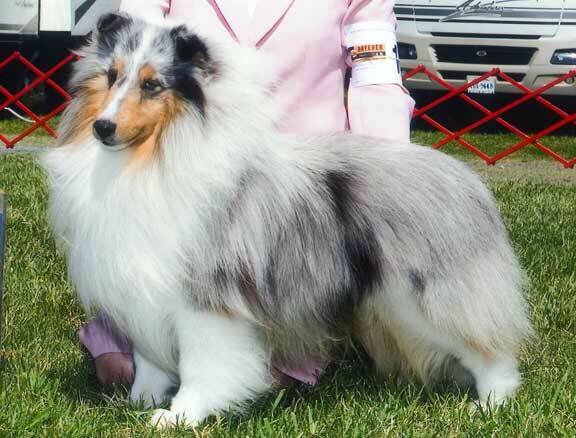 In the fall of 2003, Snickers went to 6 shows as a 6-9 Month Sheltie Pup and quickly walked away with 10 points toward his championship, a Specialty Winners Dog, 2 Best in Sweeps, and a BOS in Sweeps. This handsome shetland sheepdog absolutely loves the ring and anyone that pays him any attention. At the 2006 ASSA National Specialty, Snickers took an Award of Merit and was in the Top Three considered for Best of Breed. Snickers currently has numerous group placements, Group 1's, and multiple Best in Shows, both Specialty and All-Breed. He has exceptional balance and outline along with exquisite movement. This sheltie has particularly gorgeous front movement. He comes down from CH Shadow Hill's Leading Edge on his mother's side. His father is Shadow Hill's Polaris ROM, a great sire in his own right and son of the legendary BIS/BISS Am/Int CH Shadow Hill's Air Force One CC, OA, OAJ. Snickers is a full brother to some of our other specials, CH Shadow Hill's Star Chaser, CH Shadow Hill's Satin Dove, and CH Shadow Hill's Satin Bows.